Students from St Thomas More School who won the inaugural World Science Festival Brisbane Hatchery Crusaders competition. The impacts of ocean pollution were an important driver for students from St Thomas More School at Sunshine Beach, who won the inaugural World Science Festival Brisbane Hatchery Crusaders competition announced today. The competition, part of Queensland Museum and World Science Festival Brisbane’s educational program, invited schools to collect plastic debris and produce artwork reflecting their learnings about plastic pollution and the devastation ocean pollution has on marine loggerhead turtles. 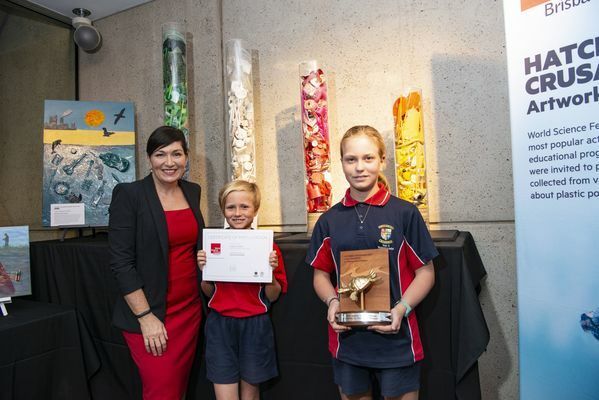 Minister for Environment, Science and the Arts Leeanne Enoch today congratulated the winning and highly commended schools. 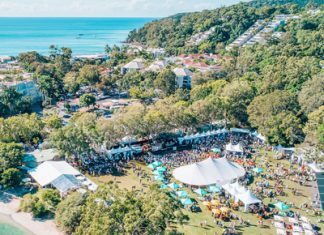 “The Hatchery is a signature event of World Science Festival Brisbane, helping to raise awareness about Queensland-based turtle research, ocean pollution and the plight of marine turtles,” Minister Enoch said. “The winning and highly commended schools have done an excellent job in creating artwork that reflects the impact of plastic on marine life,” she said. Queensland Museum Network Chief Executive Officer, Dr Jim Thompson, said plastic pollution has a devastating effect on the marine environment and the competition was invaluable in helping raise awareness of this important issue. “The students at St Thomas More have used incredibly creative ways to convey what is a very important message about plastic pollution in our oceans,” Dr Thompson said. The St Thomas More School entry is titled Time to ‘Turn’ the table, and is a series of four Perspex cylinders created to bring awareness to the environmental issue of plastics in our ocean and encourages people to question their own plastic usage and challenge their opinion on the urgent need for change. The beach debris inside the cylinders is a result of collection conducted by students at St Thomas More Primary in Sunshine Beach over a two week period. Teacher Abby Muras said students who had participated in the competition had fully embraced it and taken many lessons from the opportunity. “We are very proud of our students winning The Hatchery Crusaders competition. The students had some meaningful discussions about the future of our oceans, and ways to continue to protect this important natural resource into the future,” Ms Muras said. As part of the winning prize students from St Thomas More School will also be given the opportunity to name a baby loggerhead turtle after it hatches at the festival.